Foam Roofing systems are considerably easier to maintain and repair than other roofing systems. While Built-Up roofs and single-plys must be removed and replaced after their usable lives; repairing and recoating an SPF roof enables it to last indefinitely. When a foam roof gets minor mechanically induced damage from equipment or personnel, repairing the roof can be done with a caulking gun. Larger penetrations into the roof can be temporarily sealed with caulking as well, but it is recommended that the contractor should permanently seal the area with a new layer of foam and coating. Polyurethane Foam roofing can sometimes develop blisters, the most common cause of which is due to the presence of moisture. The majority of blisters do not pose a threat to the integrity of the foam roofing system. Unnecessary repair attempts can result in leaks and premature roof problems. If repairs are warranted, it should be left to the roofing contractor to properly repair them. However, when waiting is not an option, there are emergency foam repair kits available that can do the job nicely when used correctly. 1. Cut out and remove all wet and damaged foam roof areas. Remove the old wet foam down to good dry foam. Insure the roof surface is completely dry before proceeding. 2. Using a grinding wheel, appropriate saw, or razor knife, taper the cut edge at a 45* angle away from the blister for a smooth tie-in transition with the repair foam. 3. Patch any problem areas you may find in the underlying deck. 4. 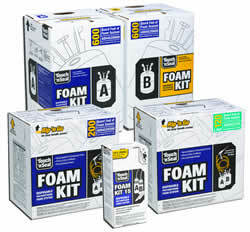 Re-foam the damaged or new roof areas with FOAM REPAIR KIT high-density, (2.5 lb to 4 lb density), roof foam in self-contained dispensers Hints: Using the foam is easy. Read the enclosed directions carefully before using. Attach the hoses, turn on the valve, and apply foam to areas. Be prepared with some rags and wear disposable gloves. Work quickly. Foam will dry and set up in just a few minutes. 5. Coat the top of the foam with the appropriate coating to protect it from future damage: We recommend using High Solid Silicone or our more cost effective high quality Acrylic elastomeric. It may be a good idea to coat your entire foam roof with this material at this time if you would like to protect the rest of the system from ultra-violet damage in the future. White reflective coatings can be used over all types of roof surfaces. UV reflectivities of the White coatings are Energy-Star rated at approximately 85%. 3. Patch problem areas using Urethane Caulk, and seal with selected coatings. For recoating a foam roof, we recommend either Acrylic Elastomeric Coatings or we recommend GE silicones. These Coating Systems are our premium quality; fluid-applied, elastomeric roof coating manufactured using advanced polymer technology. The fully adhered seamless membrane exhibits outstanding reflectivity, adhesion, flexibility and water resistance. We have lower cost elastomeric roof coatings as well. Use a single component moisture cure polyurethane sealant, such as NP-1 or Vulkem 116, (2 of the most common brands), for sealing around all roof penetrations. You can use this either before or after applying the coating. Not in every case, but in some instances Priming may be required. When in doubt test a small inconspicuous area. Otherwise use Primer when surfaces to be bonded are dirty (or oxidized and cannot be cleaned well). Primer prepares the surface into an adherent platform for seam tape or coatings to adhere to. How Much of an Overlap Seam is Needed When Applying Seam Tape Over Large Areas?